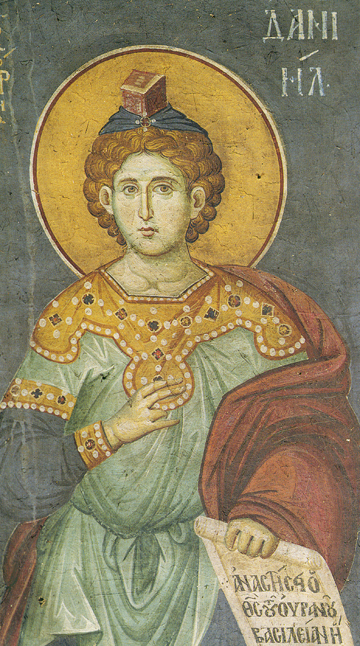 This icon of the Holy Prophet Daniel was painted by the great Thessalonian iconographer Manuel Panselinos, the foremost master of the early 14th century Macedonian School of iconography. It is a fresco on the wall of the ancient main church in Karyes, the administrative capital of Holy Mount Athos now in northeastern Greece. The scroll which the Prophet Daniel holds reads, “The God of Heaven will establish a kingdom which will never be destroyed” (Daniel 2:44). The Prophet lived about 500 b.c. and is considered one of the four Great Prophets, along with Isaiah, Jeremiah, and Ezekiel, all of which clearly prophesied about the coming of the Lord Jesus Christ. The Prophet Daniel also had visions of God and Heaven as did the Prophet Ezekiel. Faithful to God and resisting idolatry, the Prophet Daniel was thrown into a lion’s den when he refused to worship the 90 foot golden idol of King Nebuchadnezzar set up in the Plain of Dura. God preserved Daniel for the lions became tame and friendly instead of harming him, and the Prophet was even fed fresh food when an angel brought Habbakuk to feed him.